#7 Terriers headed West today, arriving in Fargo, ND for Friday's NCAA Regional semifinal against defending national champion North Dakota. Game time will be 3 p.m. ET for the contest that will air on ESPN2. Twenty years ago this month, BU also headed West and defeated another defending NCAA champion, Michigan. (video). 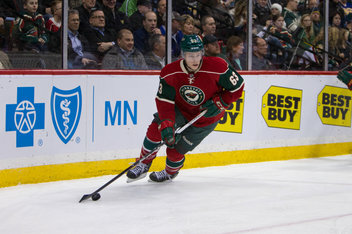 Charlie Coyle’s 17th goal was the game-winner as the Wild edged San Jose, 3-2. Nick Bonino scored his 15th goal in Pittsburgh’s 3-1 win against the Sabres.